Heat oil in a Dutch oven or large saucepan set over medium heat. Add chicken, salt and pepper. Cook for 5 minutes or until golden. Add onion, celery, leek, garlic and rosemary. Cook, stirring occasionally, for 5 to 8 minutes or until vegetables are soft. Stir in barley. Cook for 2 to 3 minutes or until coated. Add wine and bring to a boil. Add broth and bay leaf; bring to a simmer. Add carrots and potatoes; simmer over low heat for 30 minutes or until barley is tender. Remove bay leaf. Stir in green beans and grape tomatoes. Simmer for 5 minutes or until green beans are tender. Serve with Gremolata. Stir parsley with olive oil, chives lemon zest, garlic and salt. 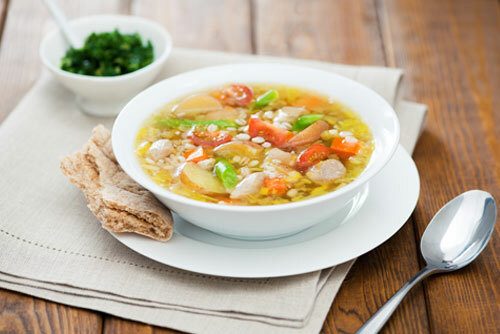 erve with a crusty whole grain bread or pita for a hearty dinner soup.